ChoiceTrade, headquartered in Central New Jersey, is another online discount broker which offers stock and options trading at a discounted price (ChoiceTrade is one of the discount brokers highlighted in my discount broker comparison post). The current trading commission at ChoiceTrade is $5 per online stock trade with no limit on the size of the order, at the same level as TradeKing’s commission ($4.95/trade). Commission for options trading costs $0.99 per contract. However, there’s a minimum of $8.95 per lag on options trading. There’s a $25 surcharge for broker-assisted trades for equity or options. There’s no minimum balance requirement to open an account. 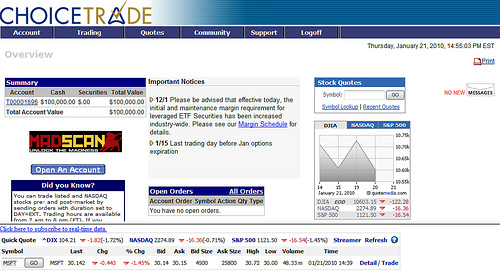 However, if you want to get streaming quotes or use their standalone trading software, there will be additional cost. Unlike other discount brokers which offer only one web-based trading platform, you can have multiple choices on how to trade with ChoiceTrade, including both web-based and standalone platforms (ChoiceTrader Select). The web-based platform is free of charge, like any other web-based trading platform. It will give you real-time quote (a snap shot), but not the streaming quotes, which you can get from other brokers like Scottrade, Firstrade, and TradeKing. For ChoiceTrader Select, which offers all of the services of the online platform plus direct access trading, advanced order entry, and algorithmic trading, there will be a $60 monthly fee. ChoiceTrade’s FREE online trading simulator allows you to try out our online platform and test trade in a real-time, simulated trading environment. You can test your option and equity strategies without opening an account and without risking any capital. The trades are 100% simulated so that your trading capital is never at risk. The executions have been simulated as well to reflect the fact that sometimes you will be filled immediately and other times you won’t, depending on market conditions. When an order is not executed you will be able to cancel or modify the order. If you make 5 trades or more per month, you can get the basic streaming for free. Right now, ChoiceTrade is offering $50 bonus for any new account opened before February 5, 2010 using promotion code JA50CT. In addition, you can also receive basic streaming for free for 4 months, as long as you maintain the account balance of $2,000 at any time through the free trail period.